The big news this week is that both the Senate and the House have named their committee chairs and committees! The Senate will have 16 Standing Committees and the House will have 34. The committees that are working hard now are the House Appropriations and Senate Finance, both of which write the budgets for the next two years. They will soon begin holding hearings on HB1 and SB1 respectively, and soon the two budgets will have to be reconciled. After the budget for 2019-21 is passed, the other committee work will begin. Public School Finance, is getting different treatments by the two chambers. According to the Texas Tribune the Texas House and Senate about $3 billion apart on public education spending. Financing Public Education Issue Chair Dian Andy has done an excellent job of summarizing the issues and bills. Click here to see her write up. In non-legislative news from Austin, the Secretary of State issued an Advisory to County Voter Registrars and Elections Administrators about the use of non-U.S. citizen data obtained from the Department of Public Safety. It alleges a large number of non-citizens are registered and voting. LWVTX President Grace Chimene and Voting Rights/Election Law Issue Chair Cinde Weatherby spent the weekend looking into the issue. Click here to see more information about it. It’s one more reason to use the easy One-Click action to contact your State Rep. and Senator about voting systems! Hot news this week deals with alleged voter registration and voting by non-U.S. Citizens. It is another reason to support our top priority of passing electronic voter registration. 1) The public education funding system is incredibly complex, inequitable and completely inadequate and must be fixed and 2) property taxes, the major source for public education funding, are rising too high. However, how we fix these two problems remains elusive. One of our priorities is to ensure funding for women’s preventive healthcare, including contraception, to fully meet the need among low-income, uninsured women. NEW ISSUE UPDATES THIS WEEK! New Budget proposals show less money for mental health and child abuse prevention. A new article on the crisis caused by the high number of children and adults in Texas without health insurance. A promising new bill which would create a Climate Change Mitigation and Adaptation Commission. A new bill could harm women trying to escape domestic abuse, and one would help victims of economic abuse. The first-ever state flood plan proposed in the Senate! CAPITOL ACTIONS FOR THIS WEEK! There will be new Action Alerts as bills move forward in the House and Senate. For now, we are asking you to let your legislators know these are issues you care about. One more reason popped up this past week to demand modernizing voter registration in Texas. For more on that and all of the other reasons, check out Voting Rights/Election Laws Issue Chair Cinde Weatherby’s blog. 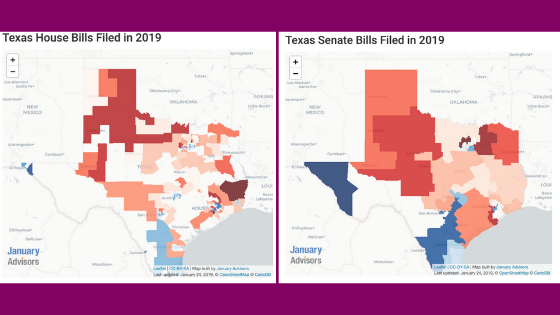 Check out Redistricting/Census Issue Chair Stephanie Swanson's blog on the League Advocacy webpages and click here to send a message to your legislators. Almost 600 emails have already gone out to Texas legislators on this issue! Follow LWVTX on Facebook, twitter and/or Instagram! Have 5 friends sign up for League text Action Alerts! Ask them to Text: ACTION, To: 80123. OTHER TEXAS ISSUES: Keep up with all the issues you care about! Legislators are interested in marijuana for medical use. Reports on Human Trafficking Prevention month! The treatment of immigrants and refugees at the border, "the wall" and changes to the Sanctuary Cities legislation are some of the bills that have already been filed. Highlights the relationship between maternal mortality and behavioral health. We are following bills relating to reform in the criminal justice system for individuals arrested and charged with a misdemeanor and improvement in the care of the mentally ill individual arrested and jailed. Reports on Texas' high rate of uninsured, as well as children affected by gun violence. Find out how much money is available for the Texas Budget. Posted a review of judicial selection. Working with partners in coalition to introduce new provisions that strengthen Texas’ Sunshine Laws and improve public oversight is the focus of Issue Chair ) work in this area. See last week's Capitol Action Minute video. We are tracking the almost 200 transportation bills that have already been filed! Toll roads, drivers' licenses, vehicle and trailer registrations, child safety seats, memorial highways, and the creation of regional transportation authorities are all on the list.